2Wheel Chick: Wanna do the Fred Whitton Challenge ? 1. This is probably one of the toughest cyclosportives you could do in the UK. It takes in all the (in)famous climbs of the Lake District over a distance of 112miles (~180km). There is no choice of distance ! 2. There's lots of climbing - just under 4,000m. As well as going over Kirkstone, Honister, Newlands, Whinlatter, Hardknott and Wrynose passes you also go over a number of other climbs that are known to the locals. 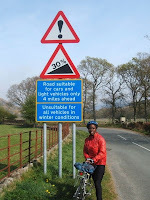 Note also that the dreaded Hardknott and Wrynose pass are to be climbed after having ridden approximately 95 hilly miles ! 3. Hardknott is scaled from the tough side (West to East). Wrynose is scaled by the "easier" side - but at that stage you will, along with many others, be obliged to get off and walk at least part of the climb! 4. This may sound very tough but don't let it put you off. It's just a matter of being prepared. Low gears - possibly even mountain bike gears would be very helpful. If you are of average fitness you will probably need at least 34 x 26 to ride comfortably - in any case a compact chainset or a triple. Practice loads of hill reps and climbing - preferably up 20% climbs. A trip over there wouldn't go a-miss. 5. Take gear for all weathers. A shower is not uncommon in these parts. Also consider your tyres. The climbs are tough. 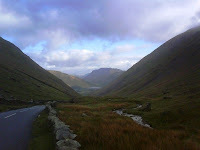 The descents (especially from Honister and from Wrynose) are very steep and technical. Grippy tyres would be a safer option. 6. You can set off when you like. Any time after about 6am is ok. The cut-off time is to be past Buttermere, near the 2nd feedstation by midday. 7. The fast riders take around 6 hours. The slowest riders can take around 12 hours. The race is usually won by a Northerner and this event is taken very seriously by the club riders around the north of England. A southerner finishing in the top 10 is doing very well ! Those looking for a fast time set off at around 9am with the "serious" crew who ride in a big peloton, charging through the lanes. Don't think they will ease off the pace when they reach Honister Pass - they don't! A few will even finish in under 6 hours. If you are likely to finish in around 6 hours that's ok, but if you're not up to doing that you'll pay for it massively later! 8. Honister Pass is the first main difficulty - not just because it's got a 25% ramp in it, but also because it happens at a time when the riders are still bunched together. Many people get off and walk, so it makes it difficult to ride through the crowd. By the time you reach Hardknott the riders are well strung out - but then climbing ramps of more than 30% bring their own difficulties ! 9. This ride is not sign-posted so keep the map with you - having said that, there are enough riders around for you to know the way and there aren't that many roads around for you to get lost on ! 10. There are 3 feedstations - all are well stocked on food and drink. There is a good post-race snack served at the finish line and a bar. 11. 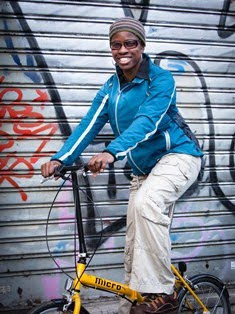 There is no mechanical support, so make sure your bike is in good working order. 12. If you can, try and stay in Coniston itself and then you're within easy reach of the start/finish area. We stayed at Lakeland House Guest House. There was also a pub/hotel (The Crown) a few doors down from us which offered accommodation. 14. Entries for this event open on the first or second Tuesday in January at midnight . You have to download the form and post your completed entry form with the fee IMMEDIATELY. Entries are limited to 1,000 riders. In 2007 the organiser received 200 hand delivered entries from local riders on the morning that entries opened. Don't even leave it to Wednesday to download your form ! 15. I would recommend this event because it's a really good challenge and you get a great feeling of satisfaction to have completed it. There's a good camaraderie among the riders. It's well organised, and despite it's popularity the event still has a local grass roots feel about it (as opposed to a corporate impersonal event). Fred Whitton's widow is usually there and is always happy to talk to the riders, thank them for coming and ask about how they found the event etc. And of course the scenery here is just stunning. The 2011 event will take place on Sunday 8th May.